Chapel Hill was the site for two large Scouting events in the 1930s. 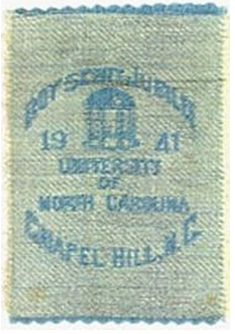 The “Carolina Jubilee” was held on the grounds of UNC in 1935 and 1938 (and again in 1941). Over 1400 Scouts from North and South Carolina attended the 1938 event including OA National Chief Joseph A. Brunton, Jr. Greensboro Council Scout Executive Frank Dix played a key role in the success of this activity. The university’s exposure to the OA’s national leadership helped pave the way for its consideration for the 1942 National Meeting. 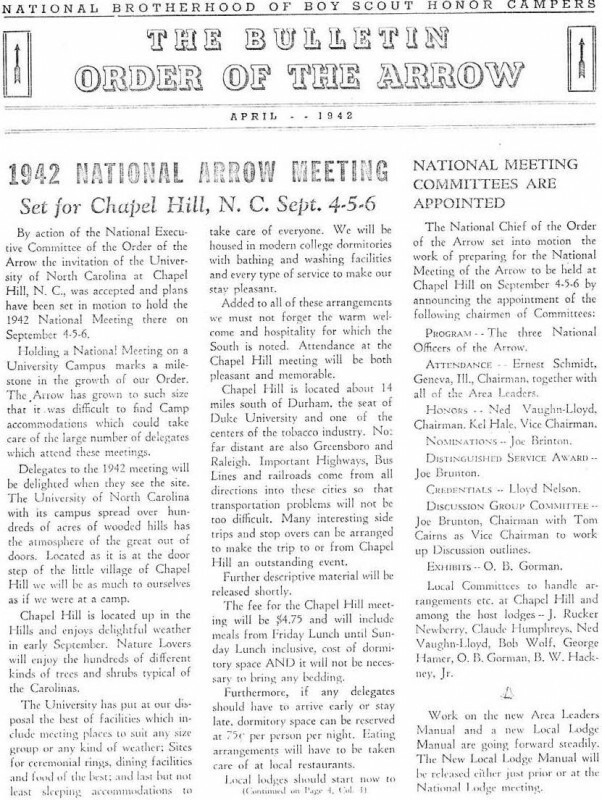 In the May 1941 issue of the “BULLETIN” the National Executive Committee of the Order of the Arrow announced its decision to hold the 1942 National Meeting at the University of North Carolina in Chapel Hill. You can read their announcement here. Tali Taktaki Lodge 70, headquartered in Greensboro, NC, was one of the strongest lodges in the South and played a key role in the chartering and initiation of several North Carolina lodges in the late 1930s. 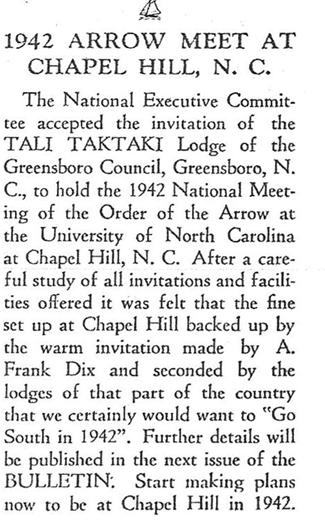 It is interesting that Frank Dix invited the Order of the Arrow to Chapel Hill which was not part of his council at the time. Mr. Dix probably acted on behalf of the lodges from North Carolina because he had joined the OA’s National Executive Committee during the 1940 National Meeting. The April 1942 BULLETIN promoted Chapel Hill as the site of the National Meeting scheduled for September 4, 5, and 6. The cost to attend this national event was $4.75. Committees were formed and most of the meeting’s details were well developed by the summer of 1942. 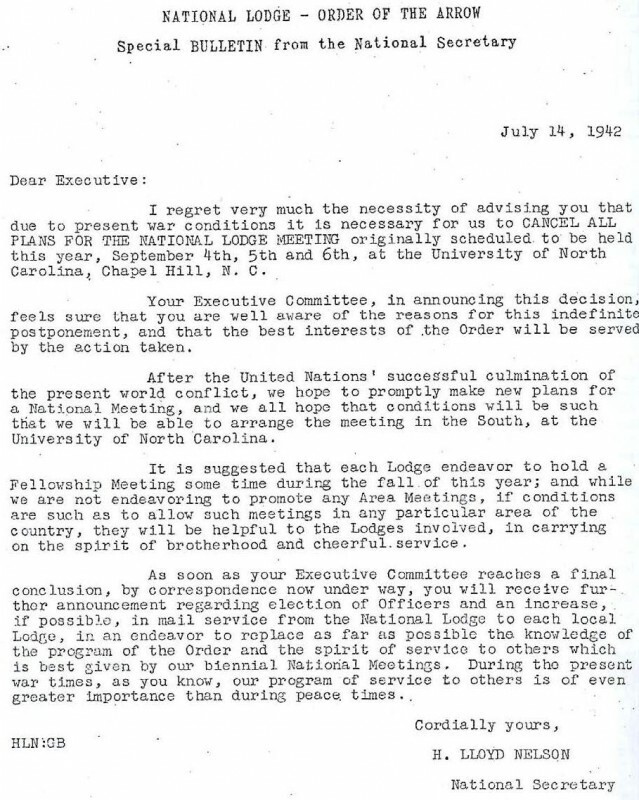 On July 14, 1942, the OA’s National Secretary, H. Lloyd Nelson, announced the cancellation of the National Meeting scheduled for UNC due to the present war conditions. The thoughts at the time was to hold the next national meeting in Chapel Hill after the war, but in 1946 the OA chose Chanute Field in Illinois due to restrictions on housing at UNC.